W-822, 9th Street, Syndicate Colony, Annanagr W.E. UNO NATURALS & GREENS PVT LTD is from Tamil nadu, India. 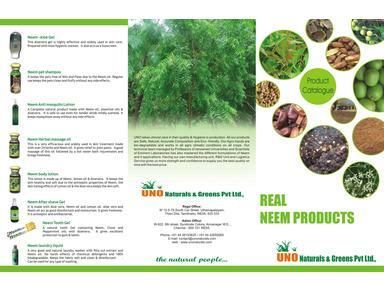 We are specialized in Neem products and its formulations. We are one of the leading manufactures, suppliers and exporters of pure Neem oil in both medicinal/cosmetic grade and agricultural pesticide grade. We have a Technical team consist of professors from renowned Universities and Scientists from Eminenet Laboratories. Our own manufacturing unit, R&D Unit and own Logistics Service gives us more strength and confidence to supply you the best quality on time with the best price. We give importance to long term commercial relations and thus quality is the strategy of our business. Neem Oil: We follow the patented cold pressed method to preserve the quality of the active ingredients in Neem and thereby maintain the maximun Azadirachtin content. We are successful in the preparations of Neem Oil and its by products, Because we take almost care of the quality. 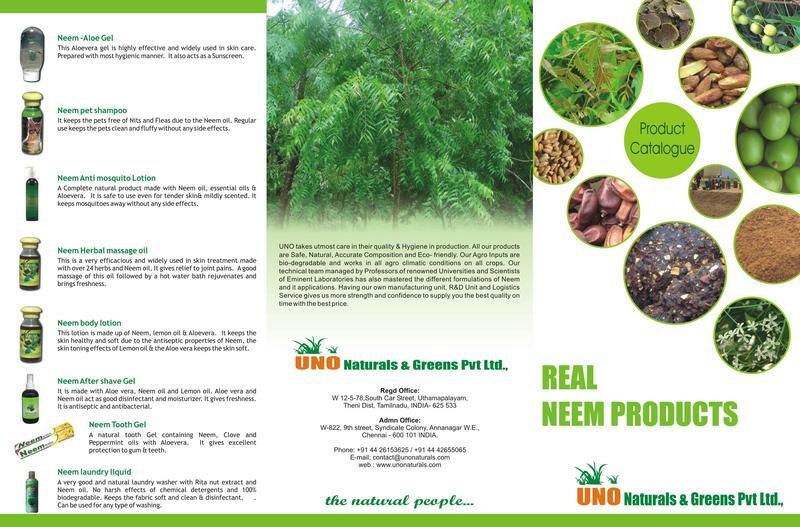 In UNO Naturals and Greens Pvt Ltd., Organic Neem seeds are hand graded to remove the immature ones and to keep the aflatoxin content nearly NIl. We take care to select seeds only from organic trees and extract oil in separate batches using the patented cold pressed method without any chemical traces. The batches are also tested and certified by R&D wing before dispatch. Neem Formulations: Our technical team managed by Professors from renowned Universities and Scientists from Eminent Laboratories has also mastered the different formulations of Neem and its medicinal applications. Besides neem Oil & Neem Formulations We also deal in Karanja Oil, Karanja Cake, Cotton Seed cake, Coconut Charcoal Briquette & Commodities like Pepper & Cardamom.